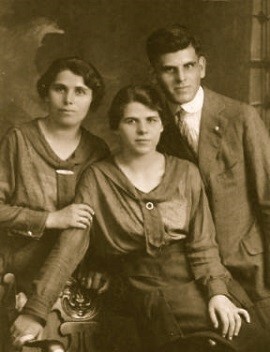 The Halperin family lived in Cherkassy before they immigrated to Philadelphia, Pennsylvania in 1914. My grandfather Louis or Leiser Halper/Halperin left from Bremen, Germany on the Breslau arriving in Philadelphia, PA on January 15, 1914. He arrived together with his mother Gittel . Two sisters Anna and Rose came to Philadelphia a few years earlier. My grandfather had a vegetable garden in his small yard in Philadelphia and he always grew sunflowers. So now I know why, for they were very common in Cherkassy. I was recently contacted by a relative who was researching her family tree. Her grandmother Rose and my grandfather Louis were brother and sister. I now know that their mother was Gittel and there were 2 sisters Anna and Rose. I don't know the name of my great-grandfather (Gittel's husband). I previously understood that my great-grandfather died in a swimming accident in the Black Sea but now I'm thinking it was in the Dnieper River. The family was also very religious and from my readings it was possible to be an observant Jew in Cherkassy. My family came to America because my grandfather wanted to avoid serving in the Russian Army and I am so glad he made what must have been a rough voyage to America! I was recently contacted by Roseann, granddaughter of Rose who was my grandfather's sister. Roseann was researching for her family tree and found me so I now have a second cousin in Boston. We have been e-mailing old family photos and stories. Any information you have on the Halperin family will be greatly appreciated. My grandfather, Isak Kalnitzki, resided in Czerkassy, Russia. He was born in Kiev on March 20th 1890. His parents were Brina Stein and Jacob Kalnitsky. He immigrated to the US on the ship The Rein, leaving from the port of Bremen. He entered the US at Ellis Island on July 12th 1913. According to his death certificate he worked as a machine operator. I believe that Etty Kalnitsky was his wife and Chane was his daughter, enterimg the US on September 1st 1923. Prior to this, they resided in Krememchug, in the Cherkassy area of Russia. The name of their ship was the Estonia, which departed from Libau. The family eventually settled in New Haven, Connecticut. Etty was a dentist; she died in 1932, at age forty-six, from breast cancer. My mom also died from breast cancer in 1976, at age 65. I carry the BRCA 1 gene mutation, which can be found in 5% of those of Ashkenazi Jewish descent. My mother and grandmother must have also carried this gene mutation. After Etty died, Isak (a.k.a. Isadore) married Ida Halbrich. They had no children. Isak died on May 28th, 1945 at age 61. He is buried at the Ind. Conn. Lodge in Westville. I came to a dead end with the Kalnitzskys. I would love to learn more. A woman who was helping me with my search said that I should go to Westville and read the funeral visitors list of friends. I haven't done that yet, as I live in California. This family is on my paternal grandmother's side. She and her family came from Cherkassy sometime between 1902 and 1911. They show up in the 1911 UK census, but not in the 1901 census. The indication for Cherkassy comes from my grandmother's naturalization file in the 1950s. In the Census she was recorded as coming from Russia, or some of the entries show Cherkus..., which we think/assume is the same place. Information also comes from the passenger list of my grandmother's older brother, Benjamin, who immigrated to the United States around 1913 on the Saint Louis to Philidelphia. His name is spelled Colominski; he is aged twenty-eight according to the record. He went on to establish a factory in Philadelphia. We do not know for sure when the family left for the United Kingdom, nor why they chose to do so. We have two spellings of the family name: one with a "y" and one with an "i". m. Harris Zackroff (first kids in 1901, so could have married in UK or in Cherkassy. 1. Michal Kolominksi is the earliest family member of whom we have indications, though we do not have firm documentation. He was born about 1830, we guess from the age his son. 2. Joe (Yosel) Kolominski was born about 1856 in Chrkus or Cherkassy and died in London in 1926. He had worked as an upholster and furnisher-maker. He married 3. Yetta (Kolominski) also in Cherkassy (we think) as family records suggest their children were born there soon from 1876. 4. . a certain Zalman. Unfortunately his family name is lost. 5. Nathan Kolominski, born about 1876 and dying in London in 1951, burried in the Edmonton Cemetry. He married Jane Epstein, but it is not clear whether they were married before arriving in the UK. 6. . Sarah Kolominski was born in about 1879 and died in Wandsworth in London in 1961. She married Harris Zackroff, and had at least three children - the early ones might have been born in Russia. 7. Annie Kolominski was born about 1889 in Cherkassy and died in Surrey, UK in 1966. Se married Joe Goldberg, who was active in local politics and became the mayor of Forest Gate in London. 8. My grandmother Rose (Rosie) Kolominski was born on 19 Dec 1892 in Cherkassy, and met my grandfather, Abraham Sandler between 1909 and 1915 when they married in the East End of London. She is living with her parents at the time of the 1911 Census. Their first child was born in 1916, my uncle Sid, who also move to Philidelphia in 1950s. 9. Benjamin Kolominsky may have been born in March 1880 and emigrated to the United States in 1907 aboard the Saint Louis from Southampton (according to the age given in the ship's manifest.. We don't know whether he first spent time in the UK or was traveling straight from the East. However, he appears to have been registered for the draft in WWII, where he gave his date of birth as 4 Oct 1894. The same records identify a wife, Sarah and mark his job as a fruit vendor and give the address of his business and presumably home as 431 Mercy Street in Philidelphia. The picture below shows Joe and Yetta, but we are not sure when and where the photo was taken. Benjamin emigrated to the US in the 1920s we think, where he set up a clothing or possibly footwear factory. My family came from Smela. I am not sure that all of the above families residents of Smela. My grandfather was Yehuda Benymin (Judah Benjamin). My Grandfather sent to his sister giving some history on his Zaide (Israel Avner Kosovsky, his Grandfather). He was born in the town of Smela in 1813. He was in the army for 22 years. He was a pious Jew. He received a hundred lashes for he refused to have his "tsis-tsis" (four cornered vest garment) removed. He fought in the Crimean War. In 1888 he arrived in the USA and lived in Cincinnati, Ohio until 1900. Then he moved to Brooklyn. He died there in about 1919. I like to get information from the Family History Library (FHL), for there are microfilmed records of genealogy significance from all over the world including records from the archives in the Ukraine. There are branches almost all over the world. I know very little about Cherkassy. I only discovered the name while finding my Grandparents immigration papers. The spelling of the names is what I have from ship manifests, and do not know if it is correct. Wolke Kramerow (born @1859),his wife Tomare (born @ 1859), their son Ischiel (born @ 1888), their son Mordche (born @1889), their son Benjamin ( born @ 1890), their daughter Leie (born @1896) , and their son Joseph (born @1900) arrived at Ellis Island on January 13, 1907. This family all went to Philadelphia. The family name was listed as Kramer in the 1910 census. Wolke became William, Tomare became Mary, Ischiel became Charles, Mordche (my grandfather) became Max, Benjamin and Joseph remained the same. On Sept. 19, 1908 another son of Wolke and Tomare arrived at Ellis Island. His name was listed as Naten Krammer (born @1879), his wife was Ruchel (born @1879), his son was Herschel (born @1903) and his was daughter Rosa (born @1907). They, too, settled in Philadelphia. Their last name was spelled as Kramer in the US. Naten became Nathen, Ruchel became Rachel, Herschel became Harry and Rosa became Rose. Original homeland for the families was listed as Zerkasch and Tscherkassy, Russia. Subsequest documentation I have shows Cherkassy, as well as some variations. Several of these family members and their descendants are buried in Mt Lebanon Cemetery in Colllingdale Pa. I have no info on this family prior to their immigration. My father was born, and grew up, in Cherkassy. He was a yeshiva student there. The Petlyura pogrom of August 1919 greatly affected his family. During the pogrom my grandfather hid in his cellar/storage room. He was found and hung. My uncle, who was then a soldier, got there just in time, and saved our grandfather. The pogrom was a terrible trauma for the entire family; as a consequence, my grandfather joined the Chalutz (Pioneer) Zionist organization. My grandparents made Aliyah to Palestine from Cherkassy in 1924, after my grandfather liquidated his merchant business. At first, grandfather worked for two years in orchards in Rechovot. Then he joined up with other friends from Cherkassy, and they settled on Mount Carmel in the Achuza neighborhood in Haifa. The group settlement was called "Rushmayia" (the water abyss). My mother also joined his group, for she came from Smela, a town in the vicinity of Cherkassy. This group lasted from 1922 to 1929, and then fell apart. Afterwards, my parents joined a newly formed group, Kfar Bilu, near Rechovot. We settled in Kfar Bilu when I was two months old, and I have lived there ever since. My grandmother died in 1936, and then my grandfather came to live with us. My grandfather was still a traditional Jew. Therefore, his influence was definitely strongly felt in our family and in our home. This was an exception to the way of life in Kfar Bilu. The family has always been very Zionistic and idealistic, and has always showed their love and devotion to Israel. My brother Oved received the "decoration of courage award" when he was killed in action. Today, Gideon Ledizhinsky is a professor in the Agriculture, Food and Environment Department of Hebrew University, Rechovot. My family came from smaller towns in this region--Gorodische and Valyava. They belonged to the Cherkasser and later Cherkasser/Smela Benevolent Society. My father was an officer at one time and I have some materials from that group. My grandfather was born in Smiela, in the Cherkassy region. Family anecdotes have it that my great great grandfather was a cantonist and I am keen on finding out about any personal connection with that. My great grandfather was originally called Walke Nicholaevsky but changed it to Nicholls shortly after arriving in England. On release from the army, cantonists were allowed to take the name Nicholaevsky Soldat and I would like to research what the name was prior to that and where the family orginated from. I am not sure that I know anything else about it. As I know my great grandfather Nechemia Orthenberg moved to Cherkassy (I am not sure if he was married there or moved there with a family). They used to live there until after the Civil War (1917). Nechemia and his oldest son Velve were killed by the Petlyura gang. After that all other family members moved out: the oldest daughter to Odessa with her husband, my grandmother to Moscow, , one more daughter to Rostov, and the mother of family with the youngest son and daughter moved to Kyev. My family is not listed in the "Vsya Rossiya" (analog of yellow pages) book for Cherkassy.